A reference to king Vikramaditya comes in an inscription found in the Kaaba in Mecca . The text of the inscription, supposedly found inscribed on a gold dish hung inside the Kaaba shrine, is said to have recorded in a volume known as Sayar-ul-Okul (meaning, memorable words) treasured in the Makhtab-e-Sultania library in Istanbul, Turkey. “…Itrashaphai Santu Ibikramatul Phahalameen Karimun Yartapheeha Wayosassaru Bihillahaya Samaini Ela Motakabberen Sihillaha Yuhee Quid min howa Yapakhara phajjal asari nahone osirom bayjayhalem. Yundan blabin Kajan blnaya khtoryaha sadunya kanateph netephi bejehalin Atadari bilamasa- rateen phakef tasabuhu kaunnieja majekaralhada walador. As hmiman burukankad toluho watastaru hihila Yakajibaymana balay kulk amarena phaneya jaunabilamary Bikramatum…” (Sayar-ul-okul, pg. 315). An inscription and a Greek account fix Muhammad’s birth in 552, not 570. Muhammad’s career took place not in Mecca but hundreds of kilometers to the north. Yehuda Nevo. The classical Arabic language was developed not in today’s Saudi Arabia but in the Levant. Long before Islam came in to existence, Kaaba, in Mecca in Saudi Arabia was a pilgrimage site. The word Kaaba might have come from the Tamil Language which originated around 1700BC. In Tamil Nadu Kabaalishwaran temple is Lord Shiva’s temple and Kabaali refers to Lord Shiva. The black stone at Kaaba is held sacred and holy in Islam and is called “Hajre Aswad” from the Sanskrit word Sanghey Ashweta or Non-white stone. The Shiva Lingam is also called Sanghey Ashweta. So what is in Kaaba could be the same what Hindus worship. The pedestal Maqam-E-Ibrahim at the centre of the Kaaba is octagonal in shape. In Hinduism, the pedestal of Brahma the creator is also octagonal in shape. Muslim pilgrims visiting the Kaaba temple go around it seven times. In no other mosque does the circumambulation prevail. Hindus invariably circumambulate or Pradakshina, around their deities. This is yet another proof that the Kaaba shrine is a pre-Islamic. In Shiva temples Hindus always practice circumambulation or Pradakshina. Just as in Hinduism, the custom of circumambulation by muslim pilgrims around the entire Kaaba building seven times shows that the claim that in Islam they don’t worship stones is not true. The King Vikramaditya inscription was found on a gold dish hung inside the Kaaba shrine in Mecca, proving beyond doubt that the Arabian Peninsula formed a part of his Indian Empire. (Ref: page 315 of a volume known as ‘Sayar-ul-Okul’ treasured in the Makhtab-e-Sultania library in Istanbul, Turkey). King Vikrama’s preachers had succeeded in spreading the Vedic Hindu sacred scriptures in Arabia and Arabs were once followers of the Indian Vedic way of life. The annual fair known as OKAJ which used to be held every year around the Kaaba temple in Mecca and the present annual hajj of the Muslims to the Kaaba is of earlier pre-Islamic congregation. . Even to this day ancient Siva emblems can be seen. It is the Shankara (Siva) stone that Muslim pilgrims reverently touch and kiss in the Kaaba. Muslims shave their head and beard and don special sacred attire that consists of two seamless sheets of white cloth. One is to be worn round the waist and the other over the shoulders. Both these rites are remnants of the old Vedic practice of entering Hindu temples clean and with holy seamless white sheets. According to the Encyclopedia Britannica, the Kaaba has 360 idols. Traditional accounts mention that one of the deities among the 360 destroyed when the place was stormed was that of Saturn; another was of the Moon and yet another was one called Allah. That shows that in the Kaaba the Arabs worshipped the nine planets in pre-Islamic days. In India the practice of ‘Navagraha’ puja, that is worship of the nine planets, is still in vogue. Two of these nine are Saturn and Moon. In India the crescent moon is always painted across the forehead of the Siva symbol. Since that symbol was associated with the Siva emblem in Kaaba it came to be grafted on the flag of Islam. The Hindu Vedic letter in Sanskrit “OM” if seen in a mirror one can see the Arabic numbers 786 and this is the most sacred number for Muslims and copies of the Arabic Koran have the mysterious figure 786 imprinted on them. In their ignorance simply they do not realize that this special number is nothing more than the holiest of Vedic symbols misread and none of the Arabic scholar has been able to determine how they chose 786 as the sacred for them. In short muslims are also going around Siva Lingam at Kaaba, seven times as Hindus go around it seven times. A few miles away from Mecca are a big signboard which bars the entry of any non-Muslim into the area. This is a reminder of the days when the Kaaba was stormed and captured solely for the newly established faith of Islam. The object in barring entry of non-Muslims was obviously to prevent its recapture. Kaaba is clothed in a black shroud. This custom also originated from the days when it was thought necessary to discourage its recapture by camouflaging it. Another Hindu tradition associated with the Kaaba is that of the sacred stream Ganga (sacred waters of the Ganges river). According to the Hindu tradition Ganga is also inseparable from the Shiva emblem as the crescent moon. Wherever there is a Siva emblem, Ganga must co-exist. True to that association a sacred fount exists near the Kaaba. Its water is held sacred because it has been traditionally regarded as Ganga since pre-Islamic times (Zam-Zam water). So that History is written not the way Muslim Invaders, the British & Nehru-Congress wanted but in a Truthful & Factual Way. Glancing through some research material recently, I was pleasantly surprised to come across a reference to a King Vikramaditya inscription found in the Kaaba in Mecca proving beyond doubt that the Arabian Peninsula formed a part of his Indian Empire. 1. That the ancient Indian empires may have extended up to the eastern boundaries of Arabia until Vikramaditya and that it was he who for the first time conquered Arabia. Because the inscription says that king Vikram who dispelled the darkness of ignorance from Arabia. 2. That, whatever their earlier faith, King Vikrama’s preachers had succeeded in spreading the Vedic (based on the Vedas, the Hindu sacred scriptures)) way of life in Arabia. 3. That the knowledge of Indian arts and sciences was imparted by Indians to the Arabs directly by founding schools, academies and cultural centres. The belief, therefore, that visiting Arabs conveyed that knowledge to their own lands through their own indefatigable efforts and scholarship is unfounded. An ancillary conclusion could be that the so-called Kutub Minar (in Delhi, India) could well be king Vikramadiya’s tower commemorating his conquest of Arabia. This conclusion is strengthened by two pointers. Firstly, the inscription on the iron pillar near the so-called Kutub Minar refers to the marriage of the victorious king Vikramaditya to the princess of Balhika. This Balhika is none other than the Balkh region in West Asia. It could be that Arabia was wrestled by king Vikramaditya from the ruler of Balkh who concluded a treaty by giving his daughter in marriage to the victor. Secondly, the township adjoining the so called Kutub Minar is named Mehrauli after Mihira who was the renowned astronomer-mathematician of king Vikram’s court. Mehrauli is the corrupt form of Sanskrit ‘Mihira-Awali’ signifying a row of houses raised for Mihira and his helpers and assistants working on astronomical observations made from the tower. Having seen the far reaching and history shaking implications of the Arabic inscription concerning king Vikrama, we shall now piece together the story of its find. How it came to be recorded and hung in the Kaaba in Mecca. What are the other proofs reinforcing the belief that Arabs were once followers of the Indian Vedic way of life and that tranquillity and education were ushered into Arabia by king Vikramaditya’s scholars, educationists from an uneasy period of “ignorance and turmoil” mentioned in the inscription. In Istanbul, Turkey, there is a famous library called Makhatab-e-Sultania, which is reputed to have the largest collection of ancient West Asian literature. In the Arabic section of that library is an anthology of ancient Arabic poetry. That anthology was compiled from an earlier work in A.D. 1742 under the orders of the Turkish ruler Sultan Salim. The pages of that volume are of Hareer – a kind of silk used for writing on. Each page has a decorative gilded border. That anthology is known as Sayar-ul-Okul. It is divided into three parts. The first part contains biographic details and the poetic compositions of pre-Islamic Arabian poets. The second part embodies accounts and verses of poets of the period beginning just after prophet Mohammad’s times, up to the end of the Banee-Um-Mayya dynasty. The third part deals with later poets up to the end of Khalif Harun-al-Rashid’s times. Abu Amir Asamai, an Arabian bard who was the poet Laureate of Harun-al-Rashid’s court, has compiled and edited the anthology. The first modern edition of ‘Sayar-ul-Okul’ was printed and published in Berlin in 1864. A subsequent edition is the one published in Beirut in 1932. The collection is regarded as the most important and authoritative anthology of ancient Arabic poetry. It throws considerable light on the social life, customs, manners and entertainment modes of ancient Arabia. The book also contains an elaborate description of the ancient shrine of Mecca, the town and the annual fair known as OKAJ which used to be held every year around the Kaaba temple in Mecca. This should convince readers that the annual haj of the Muslims to the Kaaba is of earlier pre-Islamic congregation. But the OKAJ fair was far from a carnival. It provided a forum for the elite and the learned to discuss the social, religious, political, literary and other aspects of the Vedic culture then pervading Arabia. ‘Sayar-ul-Okul’ asserts that the conclusion reached at those discussions were widely respected throughout Arabia. Mecca, therefore, followed the Varanasi tradition (of India) of providing a venue for important discussions among the learned while the masses congregated there for spiritual bliss. The principal shrines at both Varanasi in India and at Mecca in Arvasthan (Arabia) were Siva temples. Even to this day ancient Mahadev (Siva) emblems can be seen. It is the Shankara (Siva) stone that Muslim pilgrims reverently touch and kiss in the Kaaba. Arabic tradition has lost trace of the founding of the Kaaba temple. The discovery of the Vikramaditya inscription affords a clue. King Vikramaditya is known for his great devotion to Lord Mahadev (Siva). At Ujjain (India), the capital of Vikramaditya, exists the famous shrine of Mahankal, i.e., of Lord Shankara (Siva) associated with Vikramaditya. Since according to the Vikramaditya inscription he spread the Vedic religion, who else but he could have founded the Kaaba temple in Mecca? A few miles away from Mecca is a big signboard which bars the entry of any non-Muslim into the area. This is a reminder of the days when the Kaaba was stormed and captured solely for the newly established faith of Islam. The object in barring entry of non-Muslims was obviously to prevent its recapture. As the pilgrim proceeds towards Mecca he is asked to shave his head and beard and to don special sacred attire that consists of two seamless sheets of white cloth. One is to be worn round the waist and the other over the shoulders. Both these rites are remnants of the old Vedic practice of entering Hindu temples clean- and with holy seamless white sheets. The main shrine in Mecca, which houses the Siva emblem, is known as the Kaaba. It is clothed in a black shroud. That custom also originates from the days when it was thought necessary to discourage its recapture by camouflaging it. According to the Encyclopaedia Britannica, the Kaaba has 360 images. Traditional accounts mention that one of the deities among the 360 destroyed when the place was stormed, was that of Saturn; another was of the Moon and yet another was one called Allah. That shows that in the Kaaba the Arabs worshipped the nine planets in pre-Islamic days. In India the practice of ‘Navagraha’ puja, that is worship of the nine planets, is still in vogue. Two of these nine are Saturn and Moon. In India the crescent moon is always painted across the forehead of the Siva symbol. Since that symbol was associated with the Siva emblem in Kaaba it came to be grafted on the flag of Islam. Muslim pilgrims visiting the Kaaba temple go around it seven times. In no other mosque does the circumambulation prevail. Hindus invariably circumambulate around their deities. This is yet another proof that the Kaaba shrine is a pre-Islamic Indian Shiva temple where the Hindu practice of circumambulation is still meticulously observed. The practice of taking seven steps- known as Saptapadi in Sanskrit- is associated with Hindu marriage ceremony and fire worship. The culminating rite in a Hindu marriage enjoins upon the bride and groom to go round the sacred fire four times (but misunderstood by many as seven times). Since “Makha” means fire, the seven circumambulations also prove that Mecca was the seat of Indian fire-worship in the West Asia. It might come as a stunning revelation to many that the word ‘ALLAH’ itself is Sanskrit. In Sanskrit language Allah, Akka and Amba are synonyms. They signify a goddess or mother. The term ‘ALLAH’ forms part of Sanskrit chants invoking goddess Durga, also known as Bhavani, Chandi and Mahishasurmardini. The Islamic word for God is, therefore, not an innovation but the ancient Sanskrit appellation retained and continued by Islam. Allah means mother or goddess and mother goddess. One Koranic verse is an exact translation of a stanza in the Yajurveda. This was pointed out by the great research scholar Pandit Satavlekar of Pardi in one of his articles. [Note: Another scholar points out that the following teaching from the Koran is exactly similar to the teaching of the Kena Upanishad (1.7). A simplified meaning of both the above verses reads – God is one and that He is beyond man’s sensory experience. The identity of Unani and Ayurvedic systems shows that Unani is just the Arabic term for the Ayurvedic system of healing taught to them and administered in Arabia when Arabia formed part of the Indian empire. It will now be easy to comprehend the various Hindu customs still prevailing in West Asian countries even after the existence of Islam during the last 1300 years. Let us review some Hindu traditions which exist as the core of Islamic practice. The Hindus have a pantheon of 33 gods. People in Asia Minor too worshiped 33 gods before the spread of Islam. The lunar calendar was introduced in West Asia during the Indian rule. The Muslim month ‘Safar’ signifying the ‘extra’ month (Adhik Maas) in the Hindu calendar. The Muslim month Rabi is the corrupt form of Ravi meaning the sun because Sanskrit ‘V’ changes into Prakrit ‘B’ (Prakrit being the popular version of Sanskrit language). The Muslim sanctity for Gyrahwi Sharif is nothing but the Hindu Ekadashi (Gyrah = elevan or Gyaarah). Both are identical in meaning. Since Eed means worship and Griha means ‘house’, the Islamic word Idgah signifies a ‘House of worship’ which is the exact Sanskrit connotation of the term. Similarly the word ‘Namaz’ derives from two Sanskrit roots ‘Nama’ and ‘Yajna’ (NAMa yAJna) meaning bowing and worshipping. Vedic descriptions about the moon, the different stellar constellations and the creation of the universe have been incorporated from the Vedas in Koran part 1 chapter 2, stanza 113, 114, 115, and 158, 189, chapter 9, stanza 37 and chapter 10, stanzas 4 to 7. Recital of the Namaz five times a day owes its origin to the Vedic injunction of Panchmahayagna (five daily worship- Panch-Maha-Yagna) which is part of the daily Vedic ritual prescribed for all individuals. Muslims are enjoined cleanliness of five parts of the body before commencing prayers. This derives from the Vedic injuction ‘Shareer Shydhyartham Panchanga Nyasah’. Four months of the year are regarded as very sacred in Islamic custom. The devout are enjoined to abstain from plunder and other evil deeds during that period. This originates in the Chaturmasa i.e., the four-month period of special vows and austerities in Hindu tradition. Shabibarat is the corrupt form of Shiva Vrat and Shiva Ratra. Since the Kaaba has been an important centre of Shiva (Siva) worship from times immemorial, the Shivaratri festival used to be celebrated there with great gusto. It is that festival which is signified by the Islamic word Shabibarat. Encyclopaedia tell us that there are inscriptions on the side of the Kaaba walls. What they are, no body has been allowed to study, according to the correspondence I had with an American scholar of Arabic. But according to hearsay at least some of those inscriptions are in Sanskrit, and some of them are stanzas from the Bhagavad Gita. According to extant Islamic records, Indian merchants had settled in Arabia, particularly in Yemen, and their life and manners deeply influenced those who came in touch with them. At Ubla there was a large number of Indian settlements. This shows that Indians were in Arabia and Yemen in sufficient strength and commanding position to be able to influence the local people. This could not be possible unless they belonged to the ruling class. It is mentioned in the Abadis i.e., the authentic traditions of Prophet Mohammad compiled by Imam Bukhari that the Indian tribe of Jats [Jains] had settled in Arabia before Prophet Mohammad’s times. Once when Hazrat Ayesha, wife of the Prophet, was taken ill, her nephew sent for a Jat physician for her treatment. This proves that Indians enjoyed a high and esteemed status in Arabia. Such a status could not be theirs unless they were the rulers. Bukhari also tells us that an Indian Raja (King) sent a jar of ginger pickles to the Prophet. This shows that the Indian Jat Raja ruled an adjacent area so as to be in a position to send such an insignificant present as ginger pickles. The Prophet is said to have so highly relished it as to have told his colleagues also to partake of it. These references show that even during Prophet Mohammad’s times Indians retained their influential role in Arabia, which was a dwindling legacy from Vikramaditya’s times. The Islamic term ‘Eed-ul-Fitr’ derives from the ‘Eed of Piters’ that is worship of forefathers in Sanskrit tradition. In India, Hindus commemorate their ancestors during the Pitr-Paksha that is the fortnight reserved for their remembrance. The very same is the significance of ‘Eed-ul-Fitr’ (worship of forefathers). The Islamic practice of observing the moon rise before deciding on celebrating the occasion derives from the Hindu custom of breaking fast on Sankranti and Vinayaki Chaturthi only after sighting the moon. Barah Vafat, the Muslim festival for commemorating those dead in battle or by weapons, derives from a similar Sanskrit tradition because in Sanskrit ‘Phiphaut’ is ‘death’. Hindus observe Chayal Chaturdashi in memory of those who have died in battle. The word Arabia is itself the abbreviation of a Sanskrit word. The original word is ‘Arabasthan’. Since Prakrit ‘B’ is Sanskrit ‘V’ the original Sanskrit name of the land is ‘Arvasthan’. ‘Arva’ in Sanskrit means a horse. Arvasthan signifies a land of horses., and as well all know, Arabia is famous for its horses. This discovery changes the entire complexion of the history of ancient India. Firstly we may have to revise our concepts about the king who had the largest empire in history. It could be that the expanse of king Vikramaditya’s empire was greater than that of all others. Secondly, the idea that the Indian empire spread only to the east and not in the west beyond say, Afghanisthan may have to be abandoned. Thirdly the effeminate and pathetic belief that India, unlike any other country in the world could by some age spread her benign and beatific cultural influence, language, customs, manners and education over distant lands without militarily conquering them is baseless. India did conquer all those countries physically wherever traces of its culture and language are still extant and the region extended from Bali island in the south Pacific to the Baltic in Northern Europe and from Korea to Kaaba. The only difference was that while Indian rulers identified themselves with the local population and established welfare states, Moghuls and others who ruled conquered lands perpetuated untold atrocities over the vanquished. ‘Sayar-ul-Okul’ tells us that a pan-Arabic poetic symposium used to be held in Mecca at the annual Okaj fair in pre-Islamic times. All leading poets used to participate in it. Poems considered best were awarded prizes. The best-engraved on gold plate were hung inside the temple. Others etched on camel or goatskin were hung outside. Thus for thousands of years the Kaaba was the treasure house of the best Arabian poetic thought inspired by the Indian Vedic tradition. That tradition being of immemorial antiquity many poetic compositions were engraved and hung inside and outside on the walls of the Kaaba. But most of the poems got lost and destroyed during the storming of the Kaaba by Prophet Mohammad’s troops. The Prophet’s court poet, Hassan-bin-Sawik, who was among the invaders, captured some of the treasured poems and dumped the gold plate on which they were inscribed in his own home. Sawik’s grandson, hoping to earn a reward carried those gold plates to Khalif’s court where he met the well-known Arab scholar Abu Amir Asamai. The latter received from the bearer five gold plates and 16 leather sheets with the prize-winning poems engraved on them. The bearer was sent away happy bestowed with a good reward. On the five gold plates were inscribed verses by ancient Arab poets like Labi Baynay, Akhatab-bin-Turfa and Jarrham Bintoi. That discovery made Harun-al-Rashid order Abu Amir to compile a collection of all earlier compositions. One of the compositions in the collection is a tribute in verse paid by Jarrham Bintoi, a renowned Arab poet, to king Vikramaditya. Bintoi who lived 165 years before Prophet Mohammad had received the highest award for the best poetic compositions for three years in succession in the pan-Arabic symposiums held in Mecca every year. All those three poems of Bintoi adjudged best were hung inside the Kaaba temple, inscribed on gold plates. One of these constituted an unreserved tribute to King Vikramaditya for his paternal and filial rule over Arabia. That has already been quoted above. Pre-Islamic Arabian poet Bintoi’s tribute to king Vikramaditya is a decisive evidence that it was king Vikramaditya who first conquered the Arabian Peninsula and made it a part of the Indian Empire. This explains why starting from India towards the west we have all Sanskrit names like Afghanisthan (now Afghanistan), Baluchisthan, Kurdisthan, Tajikisthan, Uzbekisthan, Iran, Sivisthan, Iraq, Arvasthan, Turkesthan (Turkmenisthan) etc. Historians have blundered in not giving due weight to the evidence provided by Sanskrit names pervading over the entire west Asian region. Let us take a contemporary instance. Why did a part of India get named Nagaland even after the end of British rule over India? After all historical traces are wiped out of human memory, will a future age historian be wrong if he concludes from the name Nagaland that the British or some English speaking power must have ruled over India? Why is Portuguese spoken in Goa (part of India), and French in Pondichery (part of India), and both French and English in Canada? Is it not because those people ruled over the territories where their languages are spoken? Can we not then justly conclude that wherever traces of Sanskrit names and traditions exist Indians once held sway? It is unfortunate that this important piece of decisive evidence has been ignored all these centuries. Another question which should have presented itself to historians for consideration is how could it be that Indian empires could extend in the east as far as Korea and Japan, while not being able to make headway beyond Afghanisthan? In fact land campaigns are much easier to conduct than by sea. It was the Indians who ruled the entire West Asian region from Karachi to Hedjaz and who gave Sanskrit names to those lands and the towns therein, introduce their pantheon of the fire-worship, imparted education and established law and order. It may be that Arabia itself was not part of the Indian empire until king Vikrama , since Bintoi says that it was king Vikrama who for the first time brought about a radical change in the social, cultural and political life of Arabia. It may be that the whole of West Asia except Arabia was under Indian rule before Vikrama. The latter added Arabia too to the Indian Empire. Or as a remote possibility it could be that king Vikramaditya himself conducted a series of brilliant campaigns annexing to his empire the vast region between Afghanisthan and Hedjaz. Incidentally this also explains why king Vikramaditya is so famous in history. 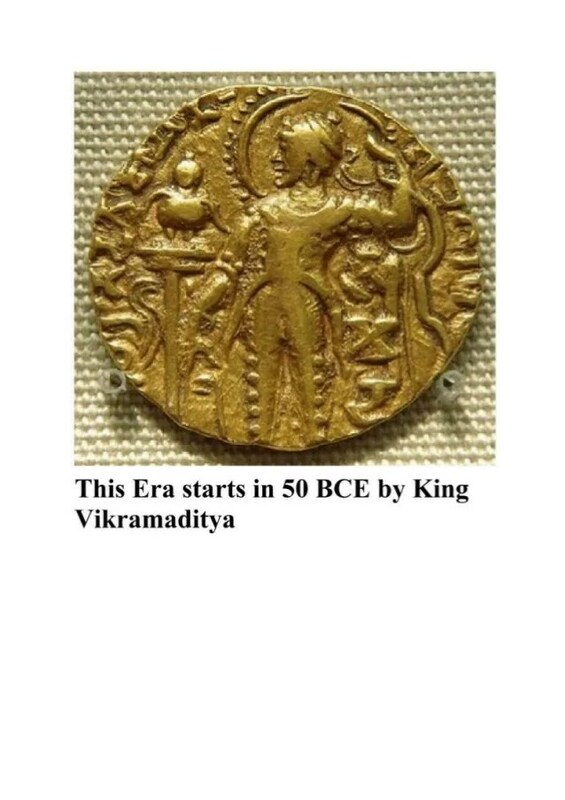 Apart from the nobility and truthfulness of heart and his impartial filial affection for all his subjects, whether Indian or Arab, as testified by Bintoi, king Vikramaditya has been permanently enshrined in the pages of history because he was the world’s greatest ruler having the largest empire. It should be remembered that only a monarch with a vast empire gets famous in world history. Vikram Samvat (calendar still widely in use in India today) which he initiated over 2000 years ago may well mark his victory over Arabia, and the so called Kutub Minar (Kutub Tower in Delhi), a pillar commemorating that victory and the consequential marriage with the Vaihika (Balkh) princess as testified by the nearby iron pillar inscription. A great many puzzles of ancient world history get automatically solved by a proper understanding of these great conquests of king Vikramaditya. As recorded by the Arab poet Bintoi, Indian scholars, preachers and social workers spread the fire-worship ceremony, preached the Vedic way of life, manned schools, set up Ayurvedic (healing) centres, trained the local people in irrigation and agriculture and established in those regions a democratic, orderly, peaceful, enlightened and religious way of life. That was of course, a Vedic Hindu way of life. It is from such ancient times that Indian Kshtriya royal families, like the Pahalvis and Barmaks, have held sway over Iran and Iraq. It is those conquests, which made the Parsees Agnihotris i.e., fire-worshippers. It is therefore that we find the Kurds of Kurdisthan speaking a Sanskritised dialect, fire temples existing thousands of miles away from India, and scores of sites of ancient Indian cultural centres like Navbahar in West Asia and the numerous viharas in Soviet Russia spread throughout the world. Ever since so many viharas are often dug up in Soviet Russia, ancient Indian sculptures are also found in excavations in Central Asia. The same goes for West Asia. [Note: Ancient Indian sculptures include metal statues of the Hindu deity Ganesh (the elephant headed god); the most recent find being in Kuwait]. Unfortunately these chapters of world history have been almost obliterated from public memory. They need to be carefully deciphered and rewritten. When these chapters are rewritten they might change the entire concept and orientation of ancient history. In view of the overwhelming evidence led above, historians, scholars, students of history and lay men alike should take note that they had better revise their text books of ancient world history. The existence of Hindu customs, shrines, Sanskrit names of whole regions, countries and towns and the Vikramaditya inscriptions reproduced at the beginning are a thumping proof that Indian Kshatriyas once ruled over the vast region from Bali to Baltic and Korea to Kaaba in Mecca, Arabia at the very least. All Arabic copies of the Koran have the mysterious figure 786 imprinted on them. No Arabic scholar has been able to determine the choice of this particular number as divine. It is an established fact that Muhammad was illiterate therefore it is obvious that he would not be able to differentiate numbers from letters. This “magical” number is none other than the Vedic holy letter “OM” written in Sanskrit (Refer to figure 2). Anyone who knows Sanskrit can try reading the symbol for “OM” backwards in the Arabic way and magically the numbers 786 will appear! Muslims in their ignorance simply do not realise that this special number is nothing more than the holiest of Vedic symbols misread. Before daybreak on the 10th during Hajj in Mecca, Muslim pilgrims return to Mina where they throw 7 stones at 3 pillars. The pillars represent “the Great Devil”, Satan, and the ritual called “Jamarat” is connected to the life of Abraham. This ritual appears to be imitated from Absalom’s shrine in the Kidron Valley in Jerusalem from the monument of Absalom (resembling a pillar). Absalom was the rebellious son of King David, based on a verse in the Book of Samuel. So the Islamic Abraham is a corrupt form of Absalom. For centuries, it was the custom among passers-by —Jews, Christians and Muslims—to throw stones at the monument. Millions of Muslims circulate the Kaaba during Hajj. According to Christian documents from 715 AD when Muslims invaded and captured slaves on the Southern European shores and accused Christians of being heretics and ‘idol worshipers’ the Christians asked Muslims why they themselves worshiped a black stone that was the head of Aphrodite? The black stone is therefore indicative if being booty from loot. The black stone in the Kaaba is said to have been transported and broke in two and then installed in the Kaaba to be worshiped. There is a black Aphrodite statue in Cyprus, one of the earliest ports of Muslim invasions in southern Europe, which is missing a head. Reblogged this on SANATAN DHARM. Om bhagwade vasu devay namah Om. understandings from Google on safety as well as safety on the internet. … You are mistaken! Castism is a English-European invention! I have heard this over and over that it is the Karma you perform that designates your level in scociety – NOT your Birth – You can be born in a the highest of Bhramin families but you can still be the lowest of lowest caste by the Karma you perform – So let us get this RUBBISH of Castes out of every language !!!!! Aan alle hindoe’s niet vergeten dat deislam heel Bharat hebben veroverd en alles heeft vernietigd zonder dat de Hindoe goden hier aan wat veranderen konte.Astinalaya , vernietigd Kurukstera verdwenen, zo goed als alle sporen van de Bharat’s is verdwenen.Hoe willen julie de Kaaba terug veroveren ?van de Molims ? Heel de Bharat cultuur is vernietigd hoe willen julie de Kaaba van de Molsim terug veroveren ? Er word ook gezegd dat de Roma’s en de Sinti’s eigenlijk overlevende van de Massakkers in de Hindoekosesh waren, dus ze zijn de naakoomlingen van Judistira Bima Arjuna , Nakula en Sahadewa ?De Korawa zijn bijn a uitgeroeid. Islam heeft overal gewonnen, maar wij weten ook door liegen en Tsurang te zijn, en nu bleek ook dat ze een nep religie is. Its a good news for sanatan hindu. Very happy to read & know the ancient history. Thanks. Very interesting…. And true too… Not only Kabba but most of Hindus and statues were hideout like this around the world…. But it should expose to all the past history should bring back the legendary king should not be remain as myth he is present in fact it should be proved to all over the world .I think some of them cannot dijest it but we as Indians has to prove over powerful kingdoms at were said to be as myths .I don’t understand if some one says great about Indian inventions and great about Legendary kings they say as myth we should bring back those all to truth .. Thankyou. This entry was posted on May 1, 2015 by Sanatan Dharm and Hinduism in Vikramaditya in kaba and tagged Vikramaditya in KABA.